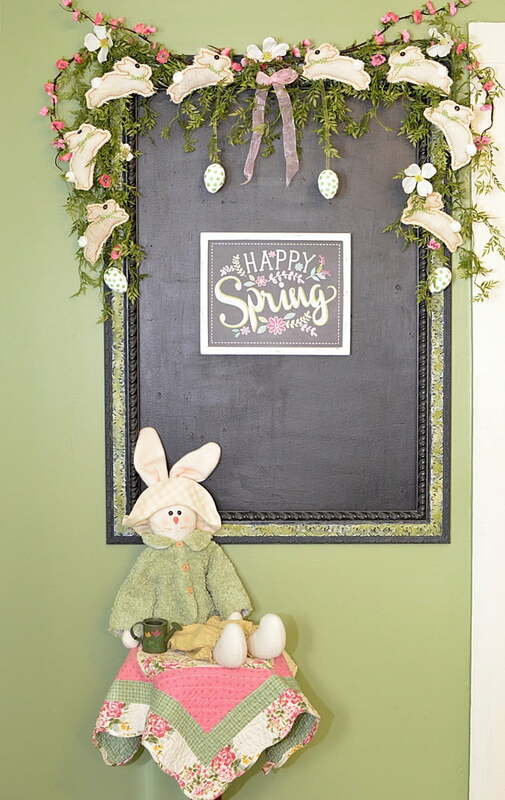 Spring has finally arrived and today I’m sharing my Happy Spring Chalkboard that’s in the kitchen! Without a doubt, spring is my favorite season. I just love the rebirth and renewal of life, and of course, the return to gardening! This has been a most unusual winter here in South Carolina. After enjoying warm temperatures during January and February, the temps dipped down to freezing and we even had snow last week! But as it warmed up, I got busy and started some spring decorating. This year I started spring decorating in the kitchen. For those of you who may be visiting for the first time, we have a large chalkboard in the kitchen that gets decorated each season. 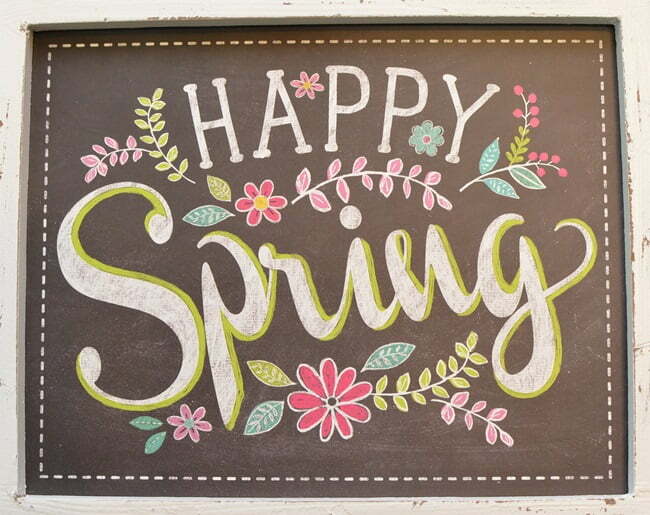 Now I know you are impressed with my fancy lettering and artwork on the chalkboard that says “Happy Spring” right? Well, I have to fess up and admit that I didn’t do that myself. It would take a lot of time and effort (and maybe a little bad language)for me to do something like that! I ran across this chalkboard sign at Hobby Lobby last week, and I loved all of its colors. So it became the springboard for the rest of my spring kitchen decorating. I started with a base of faux vine that I already had and pulled out my white burlap bunnies that I made several years ago. 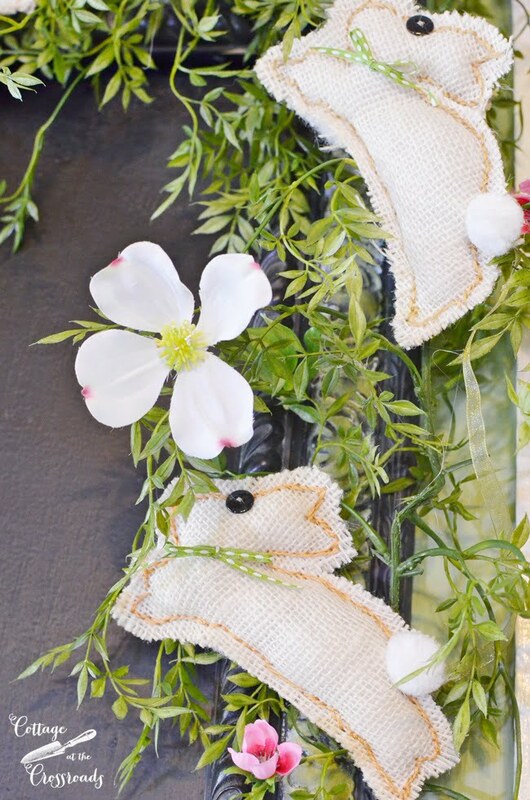 You can get the directions on how to make them here: WHITE BURLAP BUNNIES. To bring in the pink color, I found some artificial quince flowers in my stash and hot glued them to the vine. Next I added some dogwood blossoms in the mix. 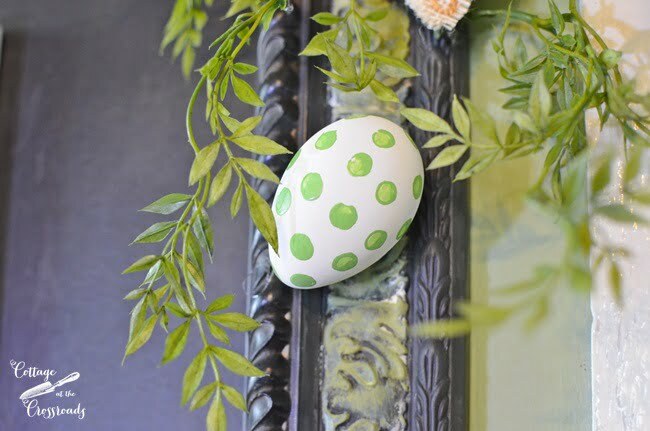 See that green polka dot egg? I quickly made a few of them to add to the chalkboard. 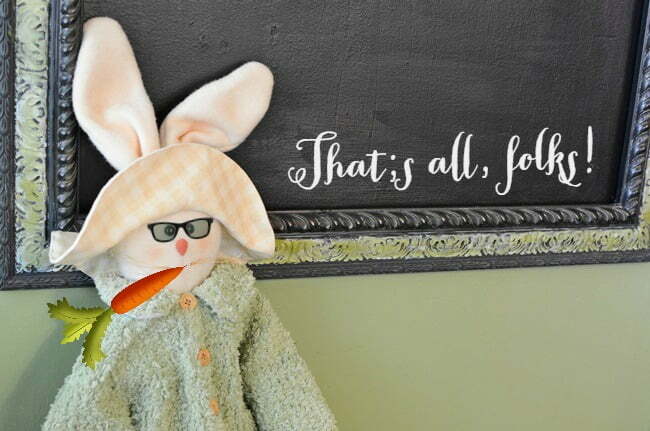 Before I knew it, the bunnies were cavorting and the eggs were hanging on the chalkboard! And a little pink ribbon tied it all together! Last, I placed a little pink and green quilt and a long-time bunny friend on a stand in front of my Happy Spring Chalkboard! Well, that’s all I have to show you right now but you can count on me coming back with more spring decorating soon. But today, you are in luck because I’m joining up with some other talented ladies to bring you more spring inspiration on the Hello Spring Blog Tour. A special thanks goes out to our hostess Katie from Let’s Add Sprinkles. Click on any of the links below to visit more bloggers on the tour! Everything is so cute and that chalkboard is darling! By the way, I found you via the Spring tour and fell in love with your house, as I’m an old house lover and owner myself. Your bunny garland is so wonderful! I just love it! The burlap bunnies and polka dot eggs are adorable! I also love your cheery spring chalk board. I hope my Hobby Lobby gets some in. Just discovered your site and I love it! My husband and I bought 4 acres 5 years ago that had an old house on it. We had the notion that we would build a new house someday but right before starting the process, we decided to renovate instead! We figured why get into a 30 year mortgage 10 years from retirement and who needs 2000+ square feet of junk when 1000 holds what we need. So happy with our decision! Love your site! Those burlap bunnies are precious. Can’t wait to read the tutorial. What a sweet focal point in the kitchen for springtime. Enjoyed being on the spring blog tour with your. Love Charleston!! 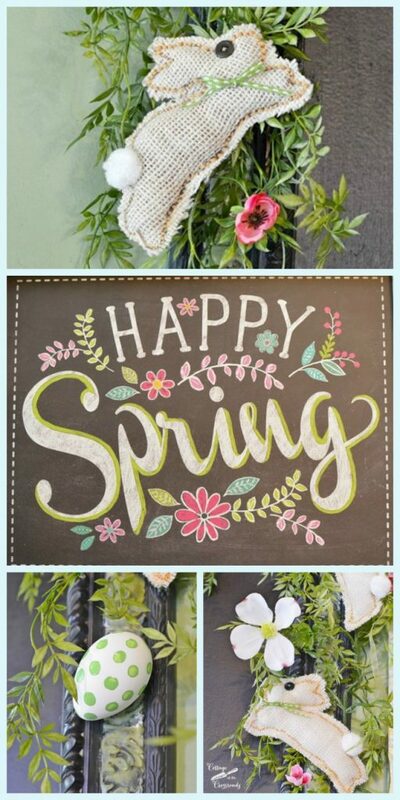 That is the cutest Spring chalkboard; I had to pin it to my Pinterest board, Spring. 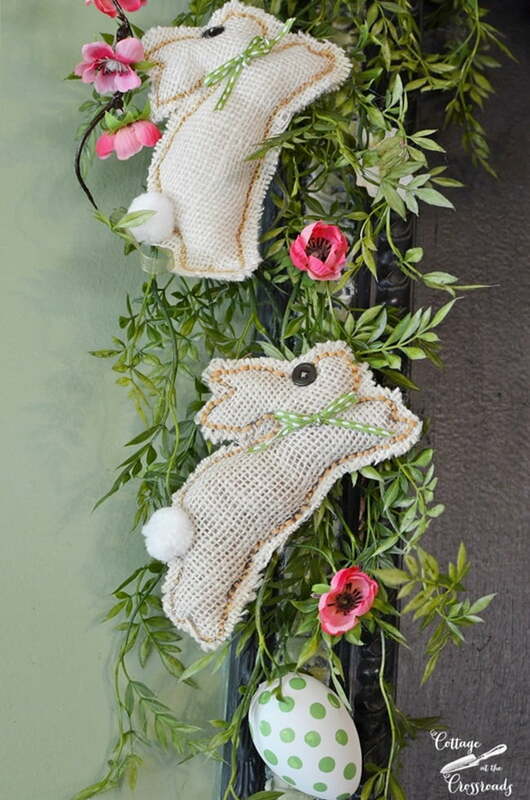 Your little burlap bunnies are adorable, and the hanging eggs just complete the look. Great tip for painting spots with a pencil eraser. 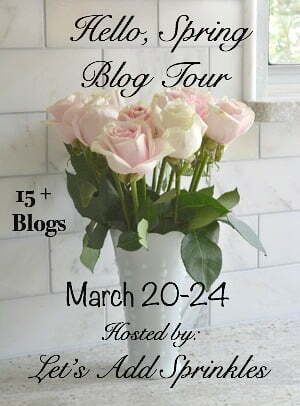 Love being on the Spring blog tour with you. Very sweet! I just love your burlap bunnies. I just don’t get to Hobby Lobby enough….what a great sign. Love the chalkboard and the bunny is precious with her quilt. I just love bunnies. This is so adorable! I love all those little bunnies and the whole project is as cute as can be! Completely Darling!!! You made me smile at the bad language versus chalkboard. I tried my hand at it recently and it truly is a labor of love. 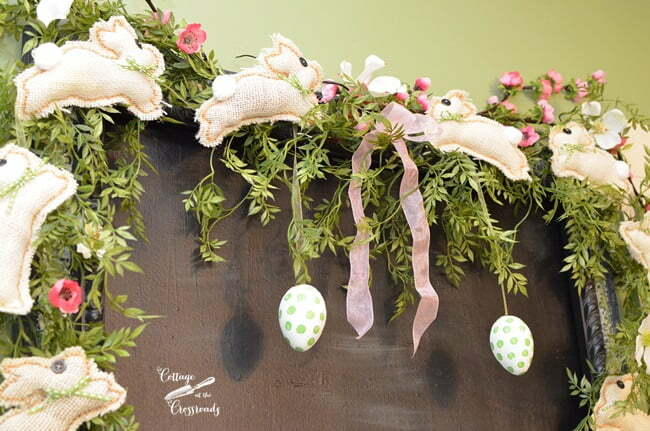 🙂 I adore the burlap bunnies and the entire garland is enchanting. It is adorable. The garland is wonderful. I love how you combined a great Hobby Lobby find with your own creations. 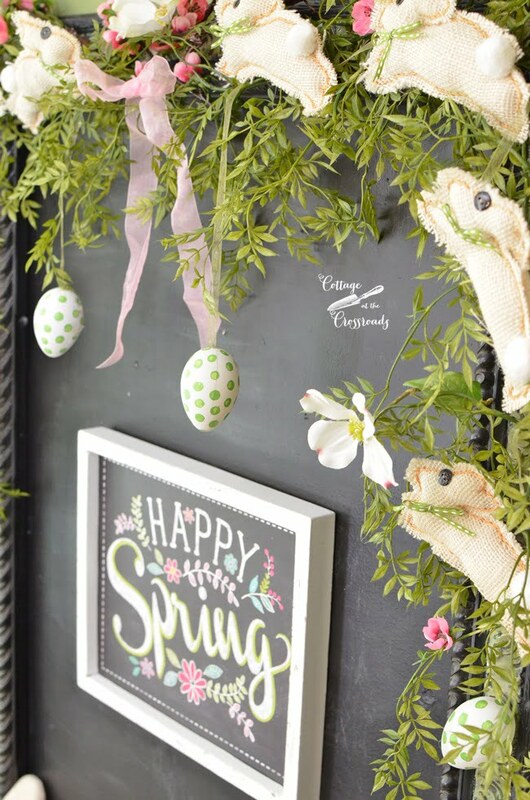 Your spring chalkboard is lovely! Love this! 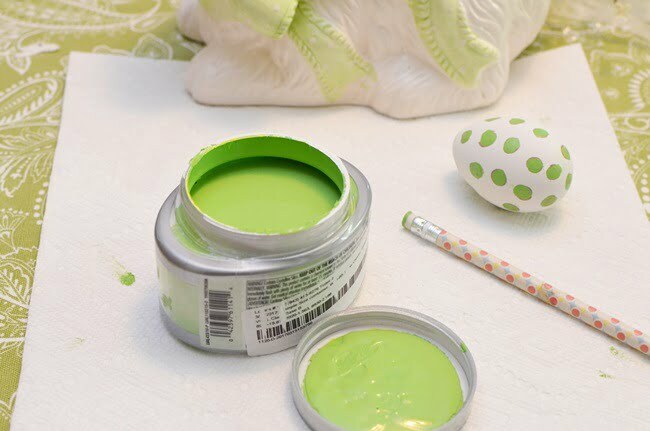 I have to make some of those cute eggs! How did you mount the small chalkboard to your larger one? Thanks! Happy Wednesday!